Do note that not all 3D models will look nice if you reduce their number of polygons in order to make them into a Low Poly version of the original model, some will just not be Ok, others might end up surprisingly good, so do try and experiment. 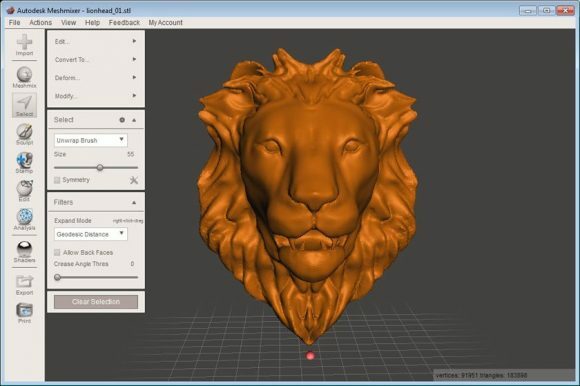 I have chosen a 3D model of a Lion Head to work with in this guide to illustrate the process. It might not be the best one for Low Poly version, though it does work pretty well for the purposes I need it… again try and experiment with different models to see what works better and what not. 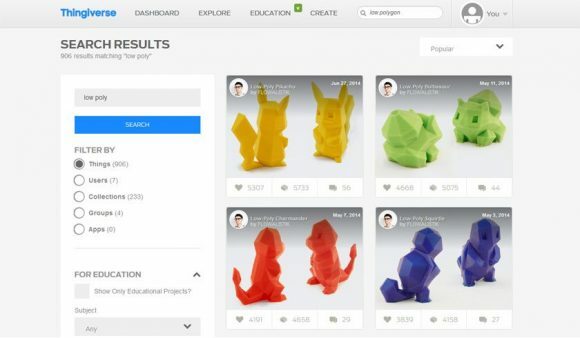 What you need to look for is a 3D model that is already pretty detailed and comes with a lot of polygons, so that you can reduce them significantly. 3D models with not that many polygons building them up that already may look a bit blocky are usually not a good source of material. I have already covered an easy tutorial on how to make lower polygon count 3D models using Blender look smoother, so you might want to take a look at that earlier post. 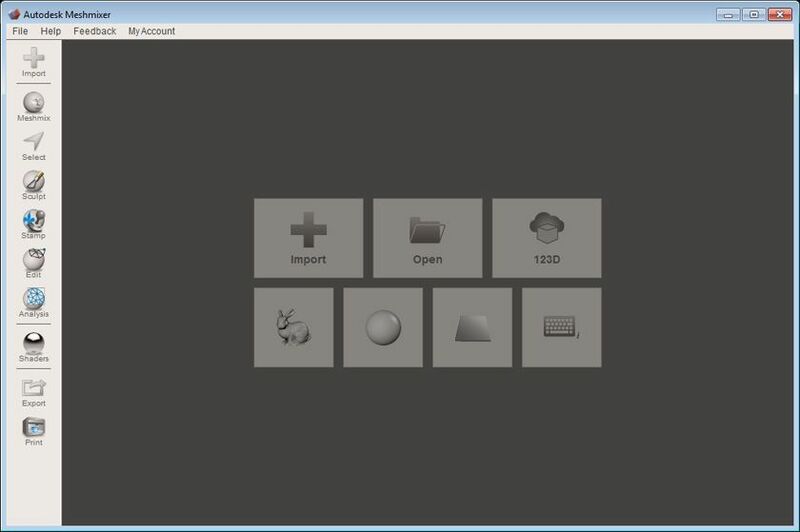 You need to start by Importing the 3D model of the object that you want to create a Low Poly version of, just use the Import button and select the file you are going to be working with. 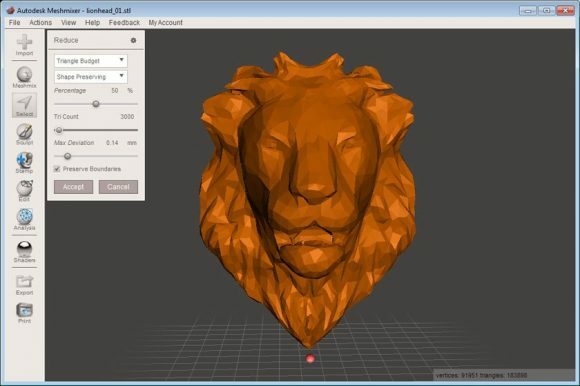 The software supports OBJ, PLY, STL, AMF and MIX file formats and the most likely one you are going to be using here is the STL as it is the most common one when talking about 3D printers. 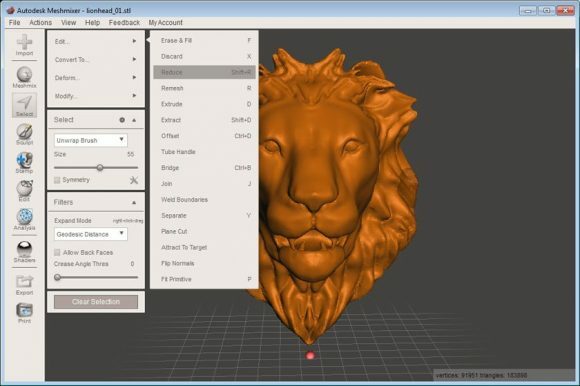 You can of course also start with an OBJ file for a 3D model of something that was not originally made for 3D printing, but for some other use or any of the other supported file formats. 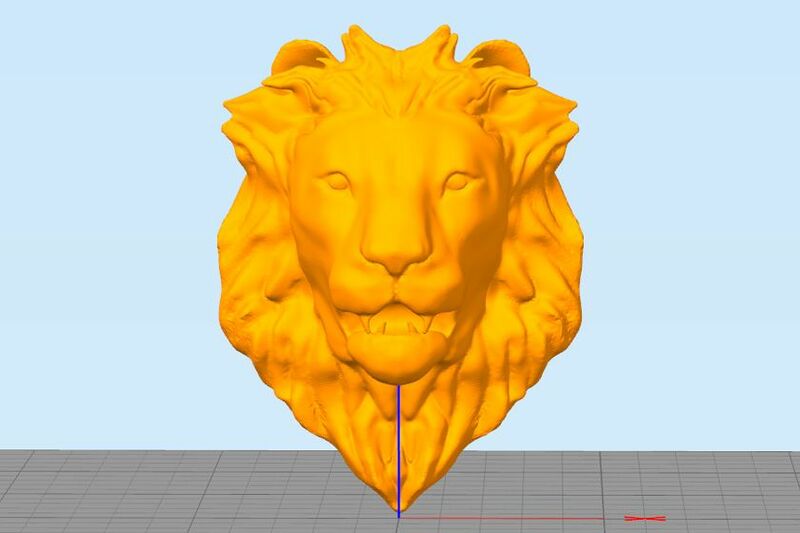 The Lion Head 3D model I’m using for this example is in STL file format as it was originally designed for 3D printing already. 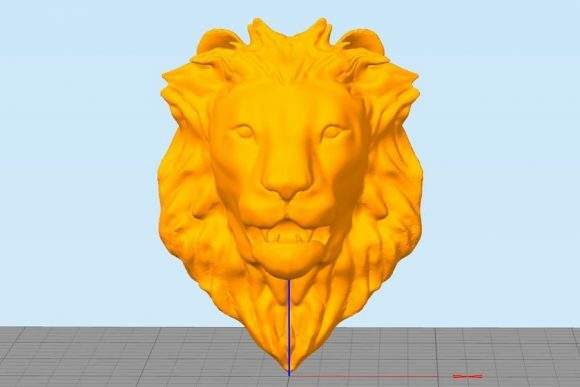 The 3D model of the head uses 183898 triangles (polygons), so it is not a very simple model and you can see that by zooming in and checking the many details that it originally has… details that would most likely be lost when 3D printed due to the lower resolution that 3D printers normally use. 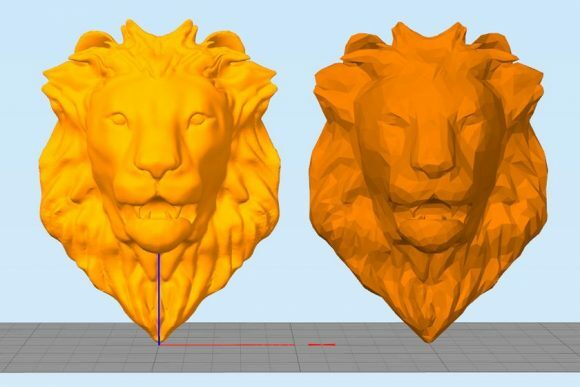 Fortunately the goal here is to significantly reduce the large number of polygons and get a Low Poly version of the model ready for 3D printing. The next step is to select the complete 3D model, to do that just press the CTRL + A key combination and you will see that the gray rendering of the model becomes a kind of orange. This means that anything you do as an operation from now on is going to be applied on the whole surface of the model, this is exactly what is needed when reducing the number of polygons. You can of course also make partial selection and work with it instead of the complete surface of the model, but for the current goal that is not needed. In the Reduce panel change from Percentage to Triangle Budget as this just makes it easier to work with and get the desired Low Poly result as you may go to below 1% on some higher polygon count 3D models. Then just click on the value on the right of Tri Count and type a new value as a number of Polygons and hit Enter to see the preview. To apply the desired value after previewing it you need to click on the Accept button, prior to that you can experiment with different values. Normally getting a good Low Poly version of a 3D model means that you need to go for something in between 1000 and 3000 triangles in the Reduce menu, though it also depends on the 3D model as well. You might need to go lower or higher than 1000-3000, but this range should generally be where you would need to try first. 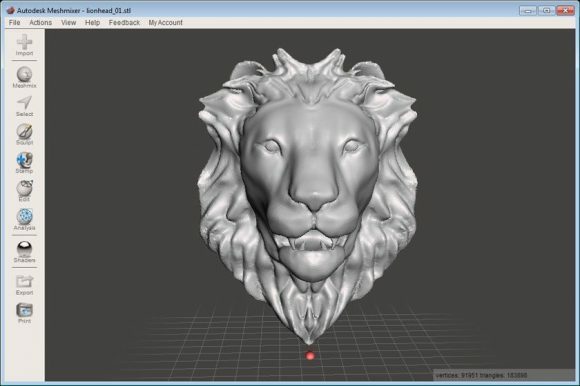 In the example Lion Head 3D model 1000 polygons are simply not enough to provide a good looking Low Poly result, so I need to go higher. At 2000 polygons things are looking better, but going a bit higher than that at about 2500 makes it even better… you can also go to 3000, but going much higher than that is not going to provide the nice low polygon look that I’m looking for. The image above shows a side by side comparison of the original high polygon count model (on the left) and the Low Poly version that I made using the Meshmixer software (on the right). The low polygon count model is with just 3000 triangles as opposed to the original that uses more than 180 thousand polygons.